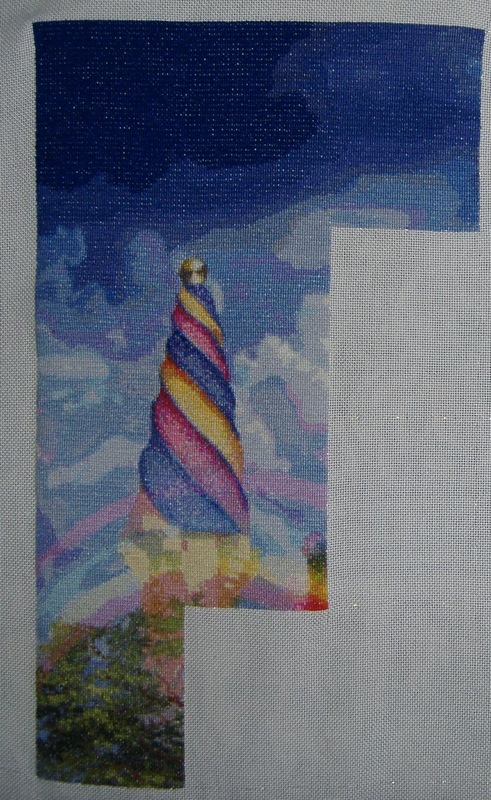 I do have an update to Lavender Moon, stitched now 287 stitches over double from my first progress. Still not much to see but in time that will change. It's been a while since I've put any stitches into Dragon Knot 2. In fact, it has been about 7 months. My last post with an update was in July (click here to see!)! This is on my list of goals to finish this year, so I hope to accomplish it! It took a while to give an update. But there was much in between. Tomorrow February is over. It's time for the Medusa to get out. March is the month dedicated to black and brown. A bit different than all that beautiful green. 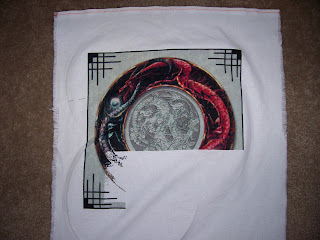 But I like the Medusa from Williams very much so it is no pain to do the dark colors. I have already half! Well, a little more sen bears. After looking at this for a couple of months, picking it up and putting it straight back down again I picked it up 5 days ago and haven't been able to leave it alone since. Hopefully it shouldn't take me too much longer to finish page 1 now, the thought of stitching a new page is encouraging me to carry on. Ok, so I am still having trouble figuring out how to post pictures from my iPad, but here goes again. Here is Qs Nice Faery....I started her in July of last year as a gift for my best friend and finally finished her last night. I am so happy with the way she sitiched up. HAED is the bomb. Thanks for looking. Hello. This is my progress on Citrine 4 weeks after I started. I'm about half way through the page, which isn't as far as I would like, but I'm working on it. Stitched on 28 count evenweave, 1 over 1. This week I had even less time for the Unicorn, still I managed to start the butterflies. However I've managed to finish the eight page of Gaudí! So now it's a week of rest, then page 11, with another dose of clouds, and the top of the house! 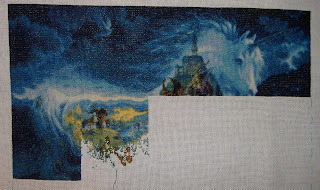 Another update of Snow White, it is still exciting every time something new in the design to see! You all do a fantastic job and I enjoy it's you up date to see! Now I've done almost 40% of her. Here is the most recent pic of Bubbles. I hope everyone is enjoying her progress. I am stitching her on 18ct aida, 1 over 1. Labels: Karen Ash Bubbles Selina Fenech. 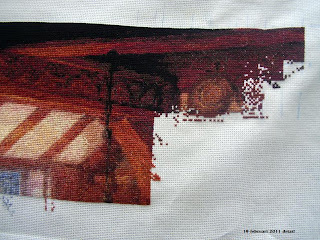 Here's the latest update on my HAED stitching as of this morning, 25th February 2011. 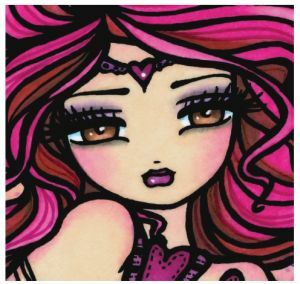 First up is Faerie Melody..... I FINALLY finished page 5. 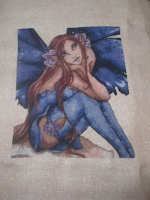 It was a nightmare of confetti stitching and obviously wasn't helped by my desperate wanting to stitch Faces of Faery 141, but I finally got there and finished the page. The blues stitched up easily but the leaves were all confetti and really irritated me but it was worth holding on and getting it done in the end. The thought of all the confetti to come in the future is so off-putting but I need to put it to the back of my mind or this will rapidly turn into a UFO and that just can't happen! I'll try to start the next page when I've finished the current FOF141 page. Next up is Faces Of Faery 141. 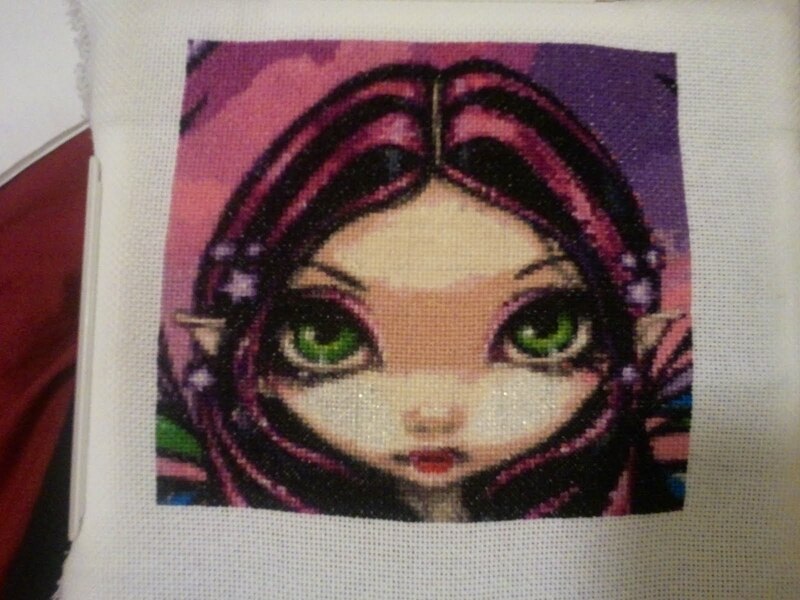 I stitched on her Saturday and Sunday before going back to Faerie Melody on Monday, once the page on Faerie Melody was done last night I got FOF141 back out and started stitching her again , so here is a current progress shot of her! She's coming along nicely and so far there's been little confetti as there's just big block of same colours which makes stitching easy and fast, I think all the confetti is going to be on her face when I get there. I've got metallics on the white rabbit coming up very soon so it'll test the suitable of this new Sulky thread I'm test-driving. 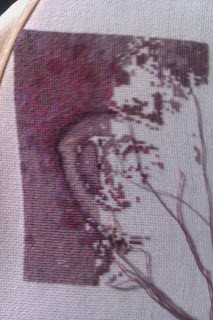 I'm really pleased with how she's stitching up though as she's a total joy! I am so chuffed! I finished the top row of pages last night *grins*. This is now 6 pages complete (although page 6 was only a partial page). Here it is! Last two months I worked mainly on The wizard of Oz. The rainbow is appearing and it is magical! I really love working on this HAED, but I like working in a rotation as well, so for now The wizard is in a closet for a while. There was a reaction on my last update about what fabric I use for this work, but I read it so late that I was afraid the writer wouldn't read my response anymore. 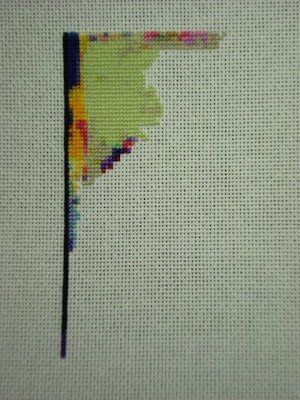 So I will response now: this is stitched on 18 count aida with 2 threads in full crosses. 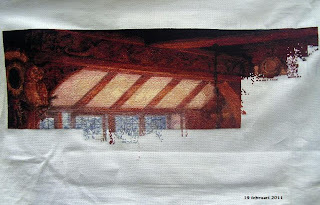 I don't like working any smaller, then I couldn't stitch on the couch! 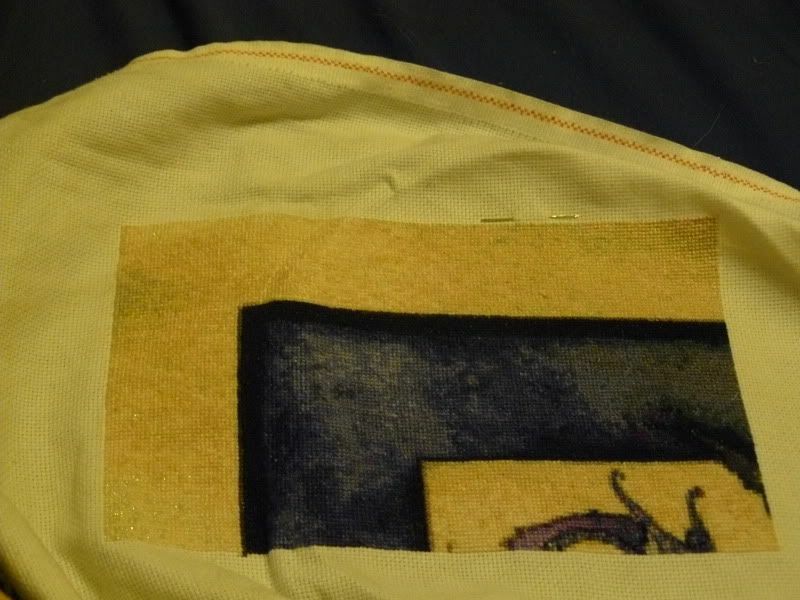 I tried stitching it with only 1 thread, but I didn't like the coverage, there was a lot of white fabric visible and especially in the darker parts of the picture I really disliked it. So I started again after stitching a almost a page. I haven't regretted it for a single moment! This is my progress on Lost in you by rachel marks. 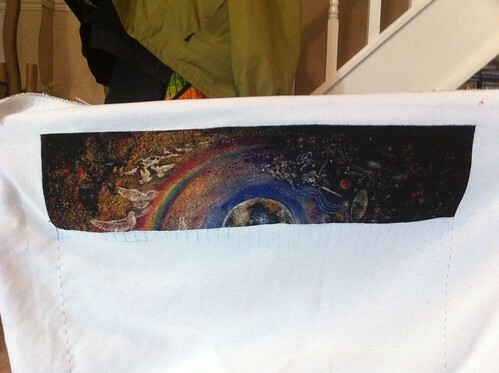 I have included a photo of what the piece will look like when finished. My HAED buddy Kim has inspired me to finally post a progress picture. This is Little One Lost from the HAED Freebie SAL. I started it in the middle of January, and can finally see parts of the kitty kat. And alot of confetti stitching! I was hoping to finish the 1st page before the next page is released, but I don't think that is going to happen. I just don't seem to get much stitching done during the work week, and weekends have been a little crazy lately. But I will continue on! 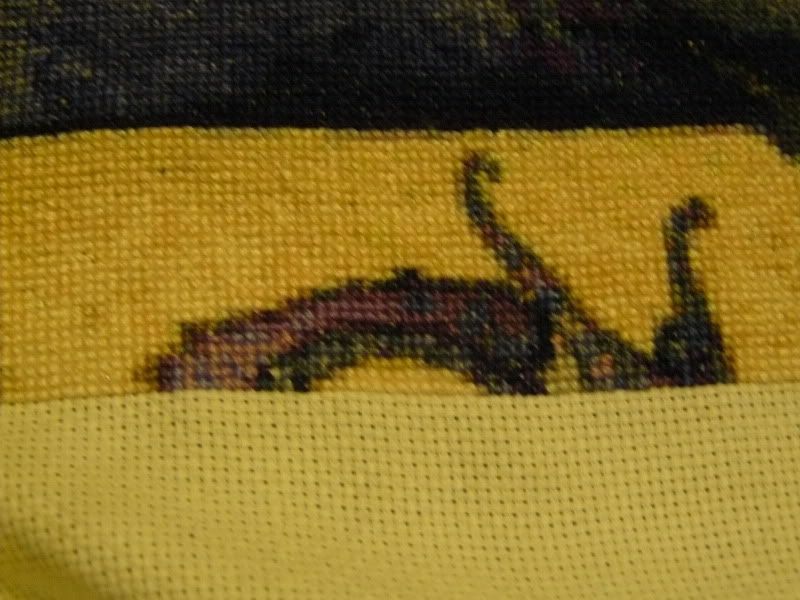 This is stitched on 25 count 2x1 tent stitch. Hi everyone, thanks again to Susan for kindly posting for me. I've actually managed some progress this time, so it almost looks like the arch of the window, well, an arch that I know it going to look like a window, one day, quite probably in the dark and distant future. But as my target for the year was to finish my first page, I'm quite chuffed with my progress thus far. Although my target was hedging my bets in case I didn't enjoy working on it. Loving everyone's progress, I do like seeing everyone elses work, (although I admit that I do usually feel quite jealous about how much more you've all done)! Anyway, the details I need to include. Stitched on 25 count evenweave, using 1 over 1 full crosses. Lancelot and Guinevere by Selena Fenech. Well Im now in full Holiday Mode! 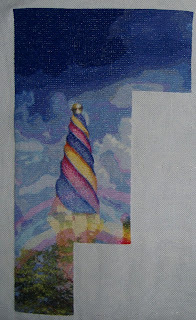 And have been happily stitching away on "Sweet Selina"
Im Loving the way this is turning out. Im now on my 3rd skein of 310 and think I will use another 2 or 3 to finish all the black. 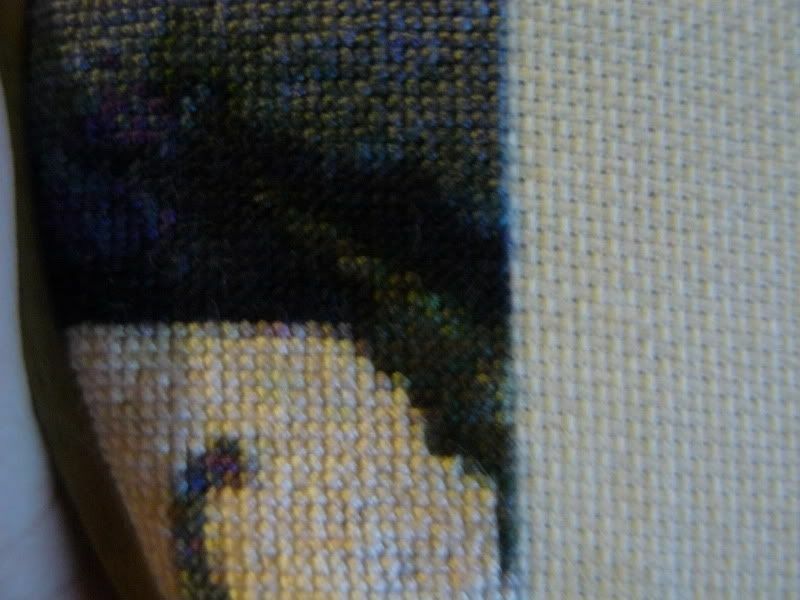 I really want to stitch the Eyes with all the colour just to add some, but am happy to wait. Labels: Manbroider, QS "Sweet Selena"
Alice has grown by half a leaf. It goes slowly. There are lots of confetti in the picture. it makes a lot of fun. I embroider small pieces with 20 cross wide. Thanks to Louanne for the change my email address. Here at long last is my update on Josephine Wall's Three Graces. 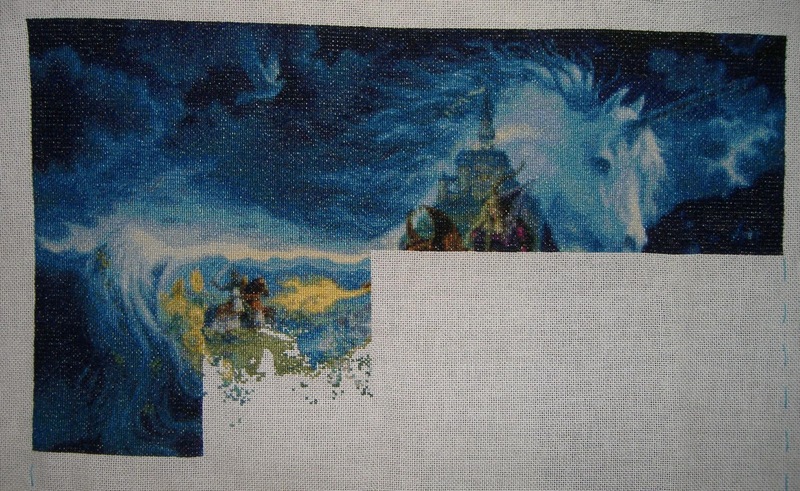 This is now 60% completed approx 128,000 sts. 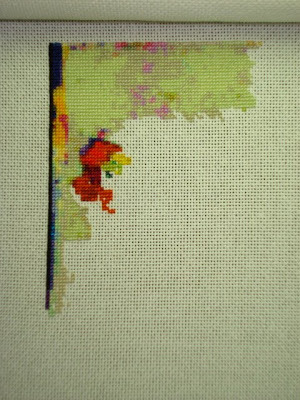 I have decided that this will be my focus project for 2011. I am taking part in the HEAD SAL and am having a wonderful time. I decided to stitch Fragile Heart and the picture above shows what she will look like. I had to do a little bit of frogging this week but I made up for it by almost completing all of the black on page 1, only a few more rows to go. I have still not received my color threads that I have ordered almost two months ago. I am worried and confused. I am receiving other packages but just not cross stitching packages. Come on Mr Postman! Hi everyone! I've been stitching a lot trying to finish my Train of Dreams. I can almost feel the finish coming. It's for my son who will be six in May so I'm trying to finish it in time to send it off to be framed. I'm also trying to finish it up since we found out my husband's job is transferring him to Japan around September so I want to finish it long before that move. This is of twelve pages done with two full pages and two half pages left. Thanks so much for looking and I hope you all are enjoying your stitching time. Well, here she is. Page 1 of Faces Of Faery 141 is finished!! Love the way she's coming out, especially the detail on the clock. On the next page done the rabiit will appear which I'm not looking forward to as he's almost entirely stitched in metallics! Dunno if I can keep my sticky little fingers off of her and go back to Faerie Melody..... have to try though! Hi, here's my progress on Curl Up With a Good Book. I'm loving it and didn't want to put it down (I actually say that about all my HAED's so must officially be an addict lol!) I hope to complete page 1 on it's next rotation. Pg 1 QS "Sweet Selena"
Almost everything under the blue part was allready stitched when I noticed I misplaced the whole part and in the wrong color. So everything had to be unpicked again. Today I finally placed the last stitch of the second page. And I have to admit, the confetti-stitching was working on my nerves. Every time taking a new thread for only one stitch in a whole area of around 500 stitches where the neck of the dragon starts. Close up from the dragon's neck. Part of the tentacle of the dragon and wing faerie. Here's the next update on Faces Of Faery 141 as of this morning, Thursday17th February 2011. As you can see I've got loads more done on her and she's coming out rather..... well, brown! The clock is rapidly appearing but it's still kinda hard to see exactly what the picture is if you didn't already know. The experiment with the Sulky pearlescent is going well, so far so good but should be able to tell you more when I get to the next page. Definately heading back to Faerie Melody after this to finish that page...... after that, who knows????? It's such a joy to stitch, I managed to finish the second page plus I have done parts of other pages as well. TT Purple Dragon ~ Finished! Finally finished her after a year with big gaps in stitching! I'm really proud of her. I'm now working on SK Sunny and kitting up for Solstice and Equinox, my first BAP! On my last post, I was asking you to guess the name of my new start, do you remember ? Congratulations to Romantic Fool who was the first to give the right answer ! It's Faith, Hope and Charity, from J. Christensen. 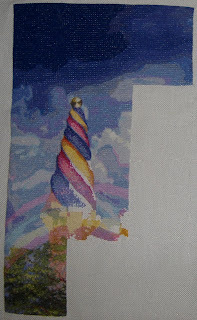 I am still stitching the first page of Queen of Hearts. I am making the bottom, with black color, and after I will fill up the hollows with the only two remaining colors of this page. I’m very slow working with frame, but I like the result. I’ve decided to start a third work. It’s “Storykeep Fragile”, (artwork by Kirstin Mills). I am doing it in lugana fabric, one over one. It’s very small, (40x181), but with a lot of confetti. I reserve it for when I am bored of as much black color as there is on Queen of Hearts or violet color on the Angelic, so I am dedicating just short time, between these two works. I didn't make too much progress with the Unicorn, but the background is almost done. However I did get ahead with Gaudí's tower. I'm guessing I'm gonna need another two weeks to finish this page! Happy Valentine's Day to you...I love all my stitching friends!!!! Well I couldn't resist starting Faces Of Faery 141 despite the fact that I still haven't finished my page on Faerie Melody yet so I guess I'll have to finish it later, which isn't a problem as with this new gridding pen as at least the gridline will still be there when I go back this time! ..... and here's my progress after a weekends work! 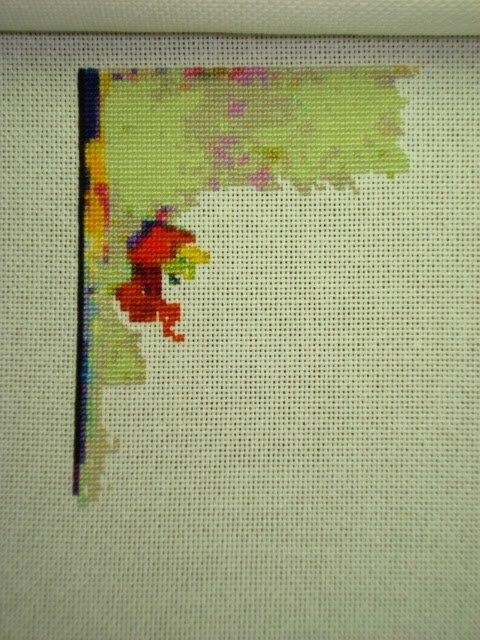 I've put in about five colours so far and she's been an absolute joy to stitch so far. I started in the top left hand corner and have decided to work down to the bottom then back to the top and down again like I'm doing with Faerie Melody. After scanning the chart I'm a little worried about stitching the white rabbit as lot of it's fur seems to be stitched in prealescent metallic so at least I'm going to get to test that new Sulky pearlescent thread I bought sooner rather than later. Special mention to threadbear for the generous RAK of this chart.... if it wasn't for you I wouldn't be stitching her at all, thank you! Laura118 - train of dreams.